Client needed to create a portable display to be used in schools for educating children on recycling and waste management, and contacted us having a concept of a space ship cockpit graphic. Also required elements that could be attached and re-attached to the background image. POD Exhibition Systems to commission a design of a futuristic and colourful image to capture children’s attention. 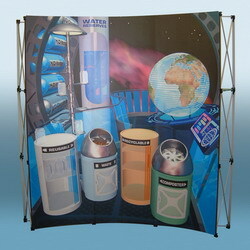 Also to source a means of attaching to a portable graphic backdrop. Having requested a rough sketch from the client, POD provided a proof of a proposed design, which the client was able to ‘tweak’ to their requirements, and then approve for POD to print the graphics. 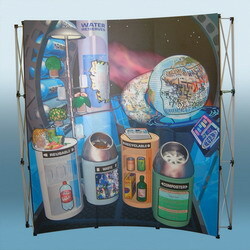 These were produced on a ‘metal paper’ material, and applied to a portable Pop Up Stand. In addition, smaller graphic pieces were produced which had magnetic strips attached to rear. These could then be applied and removed to and from the stand as required. The photos here show the completed stand both with and without the magnetic graphics applied to the front.